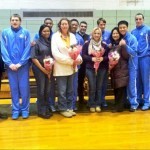 Congratulations to the varsity basketball team on its victory over LaSalle on Friday, 02/01. Senior Tim McQuail had 17 points, Junior Brian McCormack had 12 points, and Junior Kevin Torres added 8 clutch points. Junior Richie Rodriguez added tremendous play off the bench. Aggressive play and strong defense led to the team’s first CHSAA (NYC) league win.